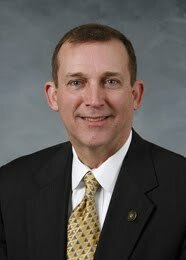 North Carolina Republican Senator (and Majority Leader) Harry Brown of Onslow and Jones counties wants to let loose the billboard industry, particularly the makers and hawkers of digital advertizing, on every North Carolina interstate or "primary highway." 1. Allow digital ("automatic changeable facing") and "tri-vision" billboards every 1,500 feet on both sides of every major highway in the state. Advertisements must stay fixed for only 8 seconds. 2. Allow by right the conversion of any existing regular billboards to digital billboards, even if they are locally "nonconforming." In other words, this is a state law which would over-rule local ordinances regulating billboards. An example of Tea-Party-style small government? 3. Increase the "cut zone" (the clear-cutting of trees) around any billboard from 250 feet to 400 feet while also (you got it!) over-ruling any local tree-cutting ordinances. So far as we can find, no mainstream newspaper in North Carolina has taken any note of this very bad law. Though there is a "No on SB 183" Facebook group growing. What business is it of any government entity to tell people what type of sign they may place on their own property. When a government does this, it constitutes a taking and the land owner should be compensated at the very least. Excuse me. We're also talking about government right of ways here. Last time I heard, we the people own the government, and the people of this state like their billboard free scenic byways. I realize it's very hard for many doctrinaire Fox-watchers to understand, but there is also in our Founding document the claim that our constitution allows the government to promote the general welfare. Not having obstructions to clear sight lines on the road, not having distractions in the corner of your eye while driving, etc., are all good and legitimate reasons to limit billboards along public highways. But I kinda like the aesthetic argument. I think it was Ogden Nash, one of the wittiest versifiers of the previous generation, who wrote, "I think that I shall never see, a billboard lovely as a tree; indeed, unless the billboards fall, I'll never see a tree at all." Most incorporated towns in NC have sign ordinance of one type or another. We also have restrictions on sizes and types of signs allowed and have prohibited signs entirely on the new 421 "scenic hiway". I could see an argument against "government taking" if we were talking about requiring existing signs to be removed. But, from what we have seem to be talking about here is a prohibition against new electronic billboards, not removal of existing ones. The bill doesn't do that! This is about property rights of owners and business owners. Sotp for a minute- and think...who do Billboards represent? Are you kidding me! It's the Furniture store down the street, it's the Riding Lawn mower guy, it's your neighbor's restaurant!!! For PETE's sake wake up! This is about LOCAL BUSINESSES. The only people that have ANY opinion on this is the PO'd ZONING PEOPLE and SIERRA CLUB TREE HUGGERS who would rather SEE ALL BUSINESS MOVE TO CHINA! Go outside now...and look up at a Billboard, your nearest one...it's your neighbor's business- you should be ashamed! Lack of billboards is not the reason North Carolina businesses moved to China. The state is already blessed with enough of these eyesores. I've never bought anything because I saw it plastered on a billboard. The "Variety Vacationland" of North Carlina is becoming the New Jersey of the South. Vermont has NO billboards period and their local businesses haven't collapsed.